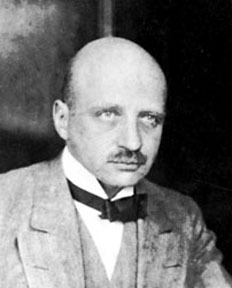 German chemist Fritz Haber was born in Breslau, Prussia (now Wroclaw, Poland), studied under Robert Wilhelm Bunsen, and won the Nobel Prize in Chemistry in 1918. He is best known for one of the Twentieth Century's landmark scientific achievements, the 1908 development of a process for synthesizing ammonia from nitrogen and hydrogen, achieved by Haber and his brother-in-law, chemist Carl Bosch. Now called the Haber-Bosch process, this allowed the mass production of nitrogen-based fertilizers and explosives. Prior to this, ammonia could only be obtained naturally, with much of the world's supply extracted by mining a 220-mile long deposit of encrusted seabird droppings on the coast of Chile. Without nitrogen-based fertilizers the earth's present population probably could not be supported, but the same nitrates are the main source of oceanic pollution, and are a key component of atmospheric smog and haze. Haber was perhaps the most outspoken proponent of the German effort to engineer chemical weaponry during World War I, proposing that chemical attacks would enable Germany to win the war with fewer casualties among its own troops, and testing various chemical recipes for their lethalities. He was at the front lines to oversee proper handling of the chemicals for the first large-scale use of chlorine gas in warfare, which released about 165 tons of the deadly agent against Algerian, French, and Moroccan forces at the Second Battle of Ypres, in France on 22 April 1915. The attack went very well for the Germans — the chlorine gas destroyed the enemy soldiers' respiratory organs, causing slow and agonizing death by asphyxiation, a process which took up to two days depending on the quantity of fumes inhaled. Estimated deaths range into the tens of thousands. At least a thousand German soldiers were killed by blowback, as the winds shifted, but Haber was hailed as a hero and promoted to Captain by imperial decree. Within days of his triumphant return to Germany his wife, herself a chemist, took her own life. In the 1920s Haber's Kaiser Wilhelm Institute in Berlin-Dahlem was prominently involved in development of a new cyanide-based insecticide called Zyklon B, a gas which was later used to kill millions of people in Germany's Nazi-era concentration camps. His other work involved autoxidation and pyrolysis, free radical research, applying thermodynamic theory on the behavior of gases, and a failed attempt to extract gold from seawater. In 1933, when Nazi race laws compelled Haber to fire twelve Jews on his staff, he was assured that his own position and life were not in danger despite his Jewish ancestry, due to a conversion to Christianity in his twenties and his own work for the German military. Haber, however, quit his academic post in protest and fled to England, where he briefly stayed with academic colleagues at Cambridge. He suffered a fatal heart attack on 30 January 1935 in Basel, Switzerland. His parents were first cousins, but his mother died from complications of his birth. He was the godfather of historian Fritz Stern, whose parents were family friends. Nearly two decades after his death, the Berlin facility where he last worked was renamed in his honor, the Fritz Haber Institute. He is also the namesake of Haber's Law, a mathematical formula for calculating the incidence and/or severity of a chemical's toxicity. He is not known to be related to the German-American physicist Fritz Haber (1912-98), who conducted pioneering experiments with weightlessness.